We may have won the Canada match, but there is still an entire day of competition to go, so we mustn’t lose focus. Yesterday was an extremely successful day for Great Britain but our goal was to come over and win in all matches, and as many individual competitions as possible. The team fell back to 900m, knowing that we have the ability to win the match as long as we all fire good, flat shots. 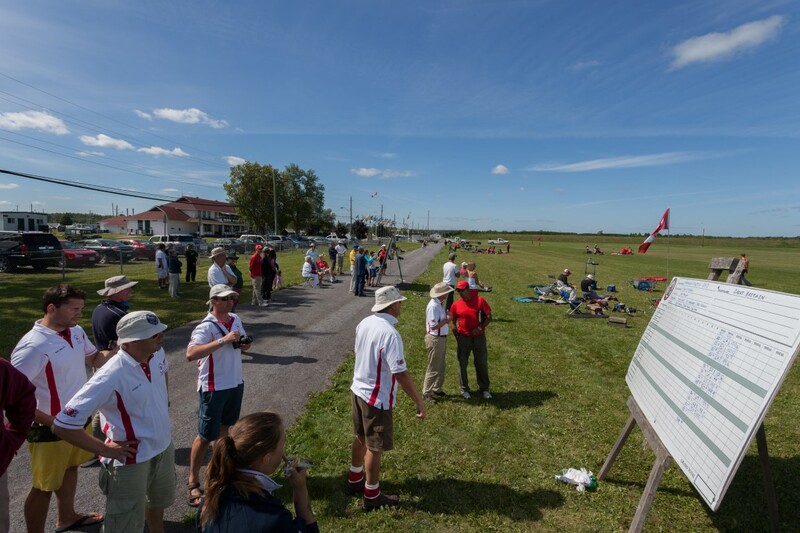 By now, the wind had started to blow a bit of a fishtail, waking all the coaches up a bit and giving them some early practice before the Governor General’s final in the afternoon. New cap Jeremy Tuck showed all the old hands how it’s done, with a fantastic top score of 100.12, closely followed by Nigel. The match was still very close though, as GB and Canada alternated the lead. With barely a point in it, our last few firers were lying down in a wait whilst the wind blew from left to right and back again. Canada were in a similar position, then the Chief Range Officer called 5 minutes remaining in the match. Like a flash, our shooters were up in the aim and the coaches were ready to fire the last remaining shots, needing to be as good as possible to maintain what we believed was a very slender lead. As their shots came up in the bull/V, whispers of a victory started making their way around the range until it was confirmed. 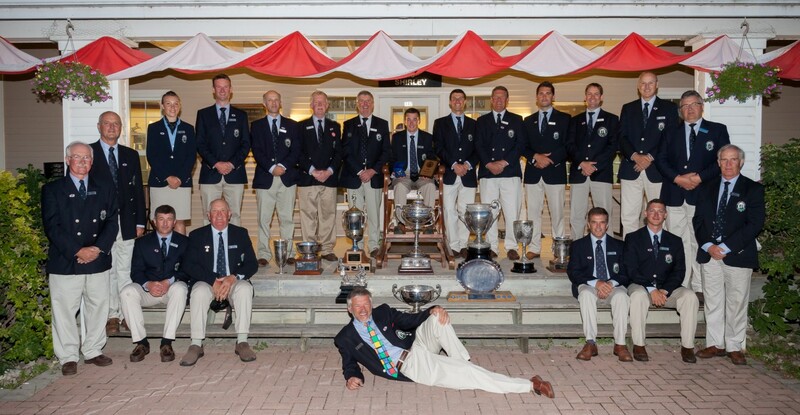 Great Britain had won the Commonwealth match, for a complete clean sweep of matches, scoring 1187.136 to Canada’s 1181.137. We are very happy to have done what we set out to do over a year ago, and retain all the trophies in 2013. This is only the 16th time since these two matches started in 1931 that GB have won the double. After the match, the Captain had one official duty left to perform – nail a pair of his shoes to the Connaught ‘shoe tree’, as per tradition. A forklift was brought in to lift him up – obviously getting a bit too portly for a ladder – and a pair of RAF dress shoes (unpolished) were nailed at the position of attention, as high as he could reach. Before we get into the serious business of the day, we really must mention an incident that happened in the middle of the day. Mr Dix is not known for his logistical prowess, and this manifested itself in his managing to lock the team out of the hut. Never fear though! 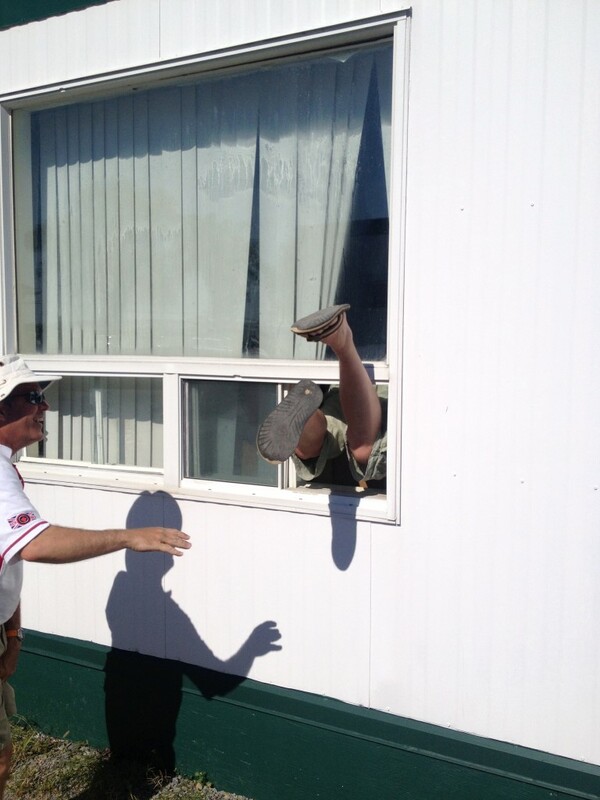 Such a slim man could always fit through a tiny window, couldn’t he? The final afternoon of competition is reserved for the Governor General’s final, Canada’s equivalent of the Queen’s final. GB had several people going in clean, with perfect scores of 150 – Dom de Vere, Jeremy Tuck, Steph Ward, Henryk Golaszewski and Jon Underwood. With the wind steadily increasing in strength all morning and through lunchtime, it was going to be an extremely challenging match to shoot. 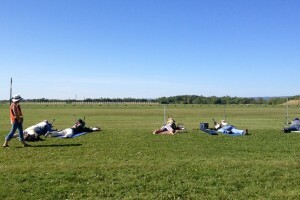 In conditions like those, it paid to be able to shoot very quickly, and those who did so came off with excellent scores at 800m. There were only three people with a 75, combined with a 150 from the first stage – Steph, Henryk, and Alwyn McLean of Ireland. After 800m Steph led the Governor General’s on V bulls, and with the way she’d been shooting, there was excitement throughout the team about being able to carry such a light person away in the chair. After 800m there is a bizarre extended break of around two hours while some Canadians shoot a qualifier to make the following year’s national team. This let some of the team escape the heat in the team hut, take on some food and water before heading out to the final range at 900m. As these things tend to be, the final distance was an enthralling affair with the lead changing hands between a handful of people – both GB and Canadians, with throngs of people monitoring live scoring behind the point. 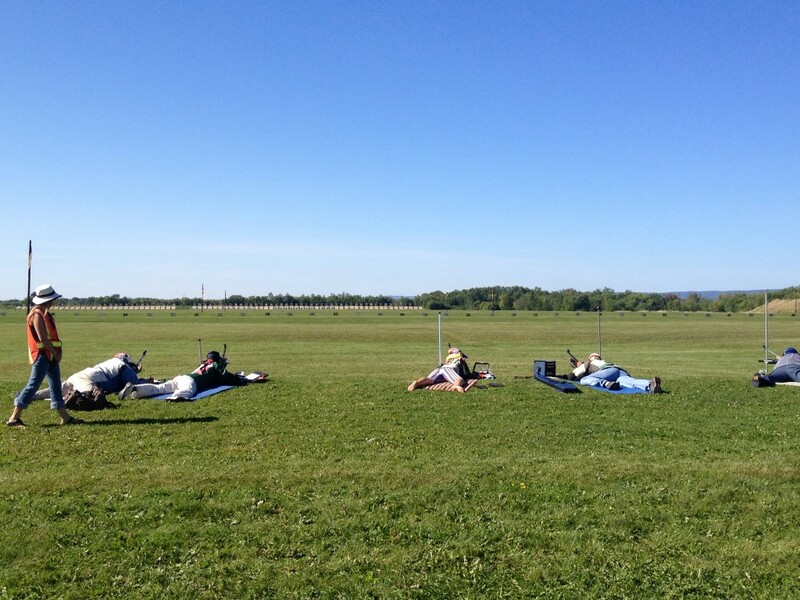 It looked like whoever won the 900m shoot would win the entire competition; such was the increasing difficulty of the conditions (a 5 minute wind bracket from one side to the other). Some mumblings started behind Henryk’s target, when one of the score monitors pointed out that he was almost finished and had yet to drop a point. The team were gathered behind his firing point for his final shot, and waited for the target to come up while Henryk nonchalantly gathered his kit. It was a bull 5! Yet to be confirmed, but he was the only person anyone knew of that had gone clean at all distances. 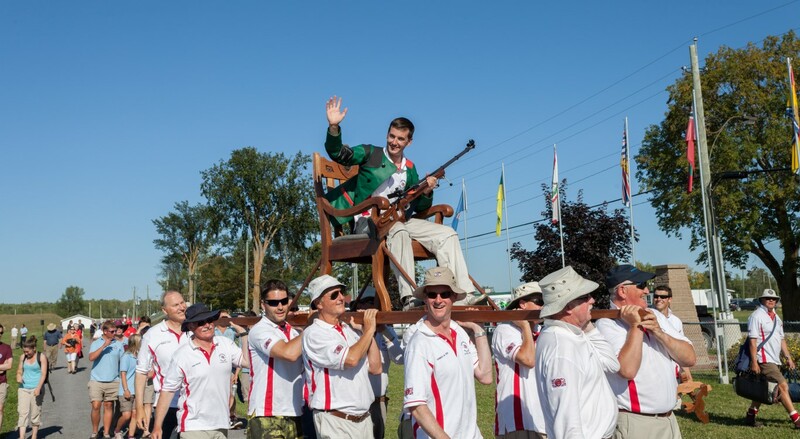 Henryk, getting his first ever GB cap, had finished the Governor General’s final with something that has never been done before in Canada – a 75.0. His group had 11 shots in the bottom right of the bull, and three others round the clock face – all while battling some extremely changeable wind. The closest competitor was 3 clear points behind him, which is a very impressive winning margin. 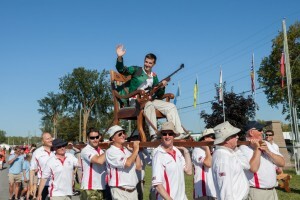 Into the chair he went, and the Governor General’s champion was chaired off behind the brass band to the DCRA office for a presentation and a large bottle of champagne – which required the help of all 20 GB team members to polish off. The team sped off (adhering to all local speed limits) to the hotel to change into number ones for the long prizegiving ceremony, where a fairly large amount of silverware – and cash – was to be collected. A few beverages were consumed before our final photo together as a team, with all the trophies and Henryk’s chair, and then it was out into Ottawa to celebrate with dinner, drinks and…other shenanigans. Just want to wish you all a hearty congratulations on a job well done. It’s good to see the RNTRC represented, and doing so well, by newbie Jerry Tuck, I look forward to shooting with you again soon. A great team performance and a typical Tremlett pose. Perfect! Congrats GB. Shame the chief coach’s good judgement doesn’t extend to choice of tie. It’s more like a technicolor yawn. Well done Team GB. Congratulations to all, you should all be very proud.